Anza-Borrego is one of many California State Parks that offer Junior Ranger programs for children 7-12 years old. Geology, ecology, history, plant life and wildlife are some of the educational topics explored. 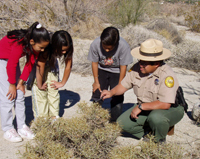 While discovering this desert environment, Junior Ranger participants have an opportunity to learn and play with other children whose families are visiting the Park. Print out the Junior Ranger Adventure Guide and have fun doing the activities with your whole family. You can then take the finished Adventure Guide to the Visitor Center to receive a Junior Ranger Award! For more information, call Anza-Borrego Desert State Park Visitor Center at 760-767-4205.